Massive fish die-offs were just one of many concerns fishermen raised with NOAA scientists during workshops held in the summer of 2018. Fishermen described how the spread of toxic algae otherwise known as a “Red Tide” event along the west coast of Florida is impacting many parts of their lives including local business. This made it clear the issue was bigger than just fish die-offs and requires a solution that is bigger than just conserving fish populations. An ecosystem-wide approach can provide such a solution. Red tide events occur when toxic algae (Karenia brevis) populations grow rapidly in the water. While these are naturally occurring events, the 2018 event is worse than usual, leading to massive die-offs of marine species and possible respiratory symptoms in humans. Typically, the impacts of red tides are incorporated into the decision-making process through stock assessments. Stock assessments can estimate the amount of fish that will die as a result of this red tide event and provide an appropriate and sustainable level of fishing mortality, in light of these events. However, NOAA scientists’ engagement with fishermen brought to light a need for additional ecosystem components to be considered. Fishermen raised concerns of red tide events affecting habitat conditions, commercial and for-hire fishing businesses, aquaculture, tourism, protected species, and human health. NOAA’s Integrated Ecosystem Assessment (IEA) is an approach that can integrate all of these concerns into management decisions. So NOAA scientists are using this approach to better understand the effects of this red tide event and identify strategies to address the issue. Moving forward, the Gulf of Mexico IEA team, in collaboration with state and federal partners, is developing a response plan for addressing the severe ongoing red tide event on the West Florida Shelf. The first step of this response plan is to better understand the red tide event. In order to better understand this event a team of scientists just conducted a South Florida Ecosystem research cruise to sample the ongoing red tide on the southwest Florida Shelf. The Cruise was funded by NCCOS and a collaboration with NOAA/AOML, NOAA/SEFSC, NOAA/NESDIS, USF, Mote Marine Laboratory and University of Miami. The focus was on quantifying human health and ecosystem impacts from the red tide event. – understand red tide bloom ecology and the successional response of the ecosystem to severe red tide events. 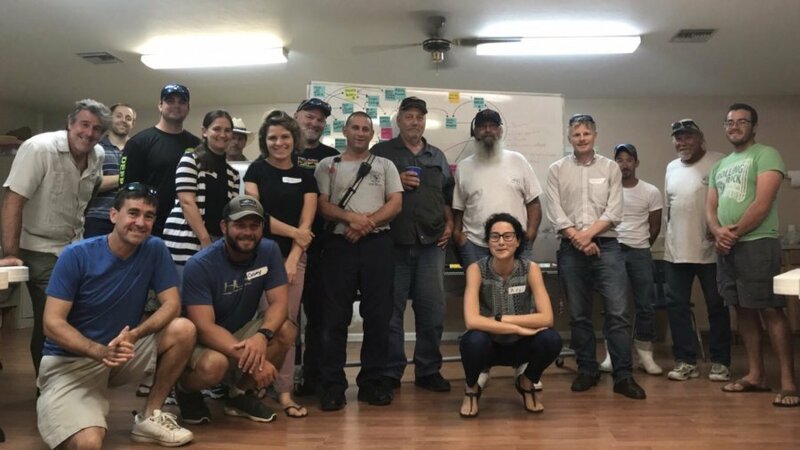 Pictured above NOAA Scientists and Fishermen at an Ecosystem workshop in the Gulf of Mexico during the Summer of 2018. Picture courtesy of NOAA. This article is reprinted from NOAA Fisheries newsletter “FishNews” November 21, 2018.